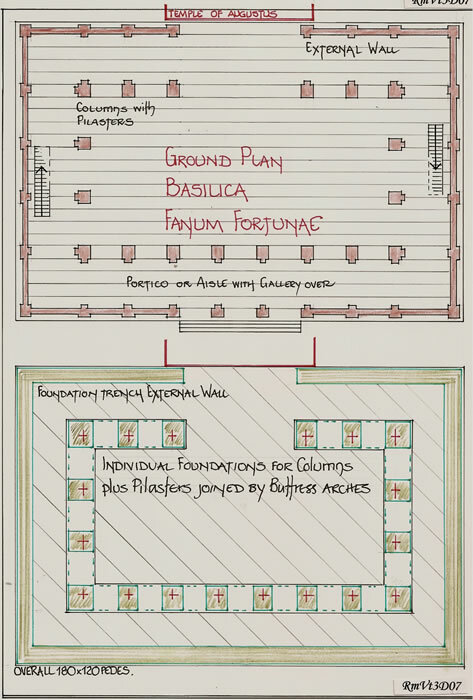 Vitruvius describes a Basilica built at Fanum Fortunae in only the vaguest of terms, prompting many researchers to reconstruct its form by not only using the 5 paragraphs of description, but, also interpreting what he may have meant by taking details from all parts of the 10 Books of De Architectura. It was also necessary to make assumptions from later research findings to complete that task. This is not the intention of text RmVt3, which only uses the information available in the text and as of c25BCE. An historical background to Fanum Fortunae is also required in order that the original text is placed in context. It was constructed during the censorship of Gaius Flaminius, 220BCE, as a route from Rome to the Adriatic Sea at Ariminium (Rimini). However it reached the Adriatic Coast at Fanum, before turning north along the coast through Pisaurum (Pesaro) to Ariminium. It quickly became an important route as trade items from around the Adriatic, and even from northern Italy, sent by sea, could be off-loaded at Ariminium, Pisaurum or Fanum to be despatched by the most direct route, 210 miles, to Rome. By the time of Octavian/Augustus (27BCE-14CE) the road system required up-grading and Octavian/Augustus set about it in a most effective manner, as he had to re-constitute the urban administration. Originally the Censors held authority for the road system, but Augustus abolished the Duoviri and personally accepted the post of Superintendent, thus he was the paramount authority. He then appointed men of Praetorian Rank to be road-makers, assigning to each of them two Lictors, and made the office of Curator of each of the great public roads a perpetual magistracy, instead of the original special or temporary commission. It appears that Augustus reserved the Via Flaminia for his own purpose, acting as Curator, and Triumphal Arches were erected, as at Ariminium and Fanum, which are still extant. The arch at Fanum astride the Via Flaminia however is perhaps not entirely in its original form. Thus Fanum probably grew from this trade base position over the 200 years of the Via Flaminia’s existence to the period of the construction of the new basilica. The first real mention of Fanum occurs with the beginning of the end of the second Punic War. Hannibal had crossed the Alps, Elephants and all and inflicted heavy defeats upon the Roman Armies. A scorched earth policy finally drove Hannibal south and it was his intention to meet with his son Hasdrubal and his army. The Romans intercepted Carthaginian messengers and were able to determine the fact that Hannibal and Hasdrubal were to meet. Thus they were able to way-lay Hasdrubal at the River Metaurus, some 2 miles south of Fanum, and completely annihilate the Carthaginians. This was in 207BCE. After a further set back Hannibal left Italy in 203BCE and the second Punic war was over in 202BCE. Thus we can postulate that with the final defeat of Hannibal and then Carthage paying dearly for that latest war, the Polis of Fanum- for we do not know if it had a cognomen in those days- chose to erect a Temple to celebrate the good fortune of Rome which led to the victory of 207BCE, and then the final victory. And thus in all probability we have good reason to suppose that the original Temple of Fortune was built c200BCE and in all probability re-dedicated to Augustus c27BCE when he in turn, knowing of the Polis on the Via Flaminia, gave it Colonial Rank as Fanum Julia Fanestris, or Colonia Julia Fanestris, and it became the home of many retired legionaries. In c200BCE the Greek Doric and Ionic Orders were the prevalent system of design. Vitruvius describes the Temple of Augustus as being “IN ANTIS” that is having Antae, an area and columns ‘before’ the Pronaos of the Temple. This is basically an Eastern Greek addition and is not normally found in Roman Temples. 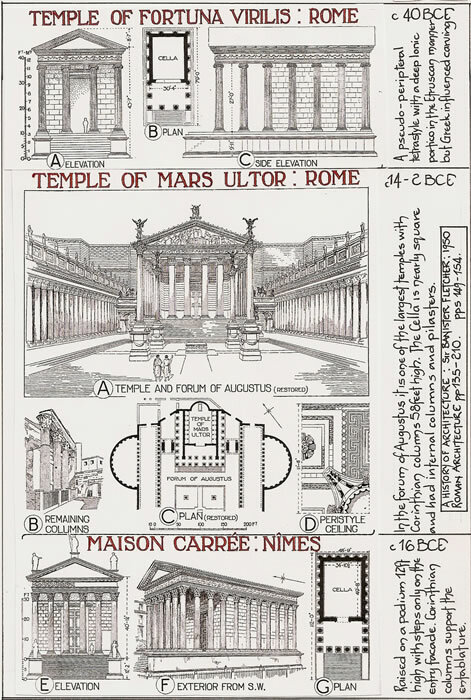 Vitruvius gives one example, another Temple of Fortune near the Colline gate, Rome, but his description given in 3:2:2 is lacking (as usual) in detail. Of either name we know little; of the actual town we really know nothing. It was effectively destroyed in the Gothic Wars by Vitiges c538CE after having witnessed another battle on the River Metaurus. The archaeological remains are thus very sparse. The Triumphal Arch erected in honour of Augustus still stands along with vestiges of the Roman Walls. Foundations of buildings have been located but their former use is at present unknown. Investigation is on-going but hard given the over-building. The fact that Fanum, now Fano, still exists is probably due to its location at a major road junction and that it was a usable port. It is at 430 50’ 03” N, Tan 0.96, or ratio 24:25 for the gnomon. In Rome itself the system of government and the laws were changing, such that in 253BCE, the Chief Priest (Pontifex Maximus), Titus Coruncanius, the first plebeian to hold that office commenced the practice of admitting students to his legal consultations and perhaps also admitted members of the general public to see law in action. Another change was the creation of the office of ‘Praetor Peregrinus’ which largely contributed to the evolution of one of the most potent and effective ideas that the Romans ever originated, ‘The Law Of Nations’or ‘ius gentinum’, which helped to develop along with the post of ‘Praetor Peregrinus’, the growth of commercial, social and political relations between Rome and other states. As the laws developed the Jurisdictional Magistrates, his Secretary and his Council (consilium) were seated on the ‘Tribunal’ which was at first a platform for the court in the open air. Under the Principate it moved into the Basilicae as they were constructed. Generally the seat of the presiding magistrate was in the middle on the front of the tribunal (pro-tribunal) and he acted “pro-tribunali” when he decided about, ‘bonorum possessio’, ‘missiones’, ‘restitutis in integrum’, ‘appointment of guardians’, ‘adoptions’ and ‘manumissions’ etc. But the seriousness of this post and its judicial function would not have placed the original ‘Tribunal’, although in the open air, in such a situation in a Polis that the general hub-bub of trade persons etc. disturbed the proceedings. Thus at Fanum we read, (5:1:8,) that the ‘Tribunal’, 46 feet across and 15 feet deep, a hemi-cycle, was actually within the Temple of Augustus. We also read in 5:1:8 that the new Basilica roof extended in a ‘tee’ form to touch the Temple of Augustus on either side of the ‘Tribunal’. We are also informed that this Temple and the Temple of Jupiter were placed opposite each other across The Forum. It would appear therefore that Augustus Caesar greatly affected the Polis of Fanum Fortunae. Following the murder of his adoptive Father, Julius Caesar in 44BCE, Octavian (as he was then named) became one of the rulers of Rome, with Anthony as co-ruler. Many problems ensued, not least Anthony’s love affair with Cleopatra VII, which led to the battle at Actium, 31BCE, which was a win for Octavian, and the final suicide of Anthony and Cleopatra which led to the annexation of Egypt. Thus after 29BCE, Octavian had Cleopatra’s money, and is thus able to pay off his veteran soldiers and found no less than 75 colonies mostly in the west. He then proceeds to reduce the Senate from 900 to 600 Senators and the army from 60 to 28 Legions, say 150,000 men, which he was satisfied he could afford to pay for. In 27BCE there is a seismic change, the rulers name Caesar is supplemented by a novel designation, AUGUSTUS, and thus Octavian Caesar becomes Augustus Caesar. He then embarked upon his aggrandisement programme for Rome; the creation of 9 Cohorts of Praetorian Guard, and his elevation in the minds of the populace (although not in name) to a God figure. Augustus Caesar lived until 14CE, and was perhaps not only the first so named but the greatest. The description within the text of Vitruvius, 5:1:7 &8 is probably of a Doric or Ionic Greek Temple which was romanized in final styling. It appears to have been built c200BCE and is described as having a Pronaos and Antae. “They are an amalgamation of Etruscan and Greek types; for while in many respects they resembled the Greek, the typical prostyle portico and podium were derived from Etruscan temples. There are several types, of which the most characteristic is pseudo-peripteral, which, instead of side colonnades, has half-columns attached to the walls with a prostyle portico in front. The steps to the principal entrance were flanked by massive, low walls which were an extension of the lateral podium, and they frequently supported groups of statuary. Greek peripteral temples were normally twice as long as their width, but Roman temples were shorter in proportion, while the Cella itself—-frequently occupied the whole width of the building. In 3:2:2, Vitruvius states “that a Temple will be “In Antis” when it has at the front pilasters terminating the walls which enclose the shrine and in the middle, between the pilasters, 2 columns, and above a gable, built with symmetry to be set forth in this book. An example of this will be the Temple of Fortune, nearest of the three to the Colline gate”. We can assess the size of the Temple from Vitruvius’ text as it holds the Tribunal, part of a circle, 46 feet across and 15 feet deep. Thus to the 46 feet across, we must add two columns, 4 feet square and the structure is then in all probability c54 feet wide which would produce a plinth width of c60 feet and probably therefore an overall length of 120 feet. Most Roman Temples are simple buildings comprising a Pronaos and a Cella, having walls with half columns or pilasters, as with the two marvellous examples extant; one at Vienne, the Temple of Augustus and Livia, c20BCE, and the other the Maison Carrée at Nimes, c16BCE. Both Temples unfortunately post-date Vitruvius. What we do not know, nor can we guess is the height of the basic plinth on which the Temple of Fortune/Augustus was built. 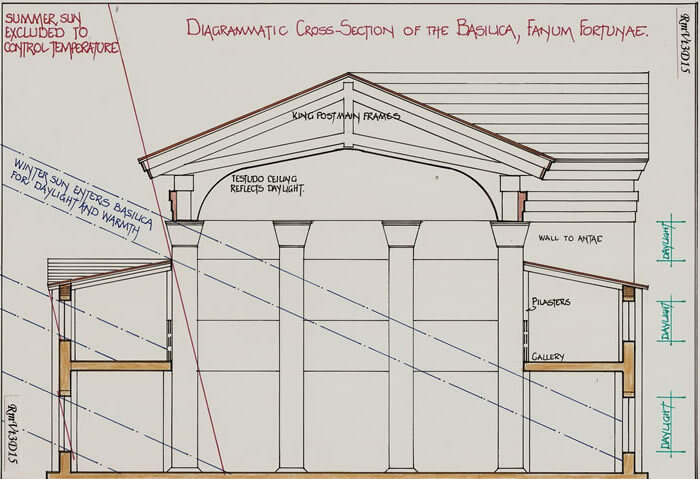 We do know the ‘beams’ around the Basilica were extended ‘over’ the Antae and possibly the Pronaos and therefore can assume a height maximum to the Temple apex which suits the Basilica design height. That will be shown to be between 45 and 50 feet. Augustus Caesar is ‘emperor’ from 27BCE to 14CE, when after his death he is deified. But, in his lifetime, as stated, he was thought of as a God Figure, the Son of a God, Julius Caesar. If a Temple was built to the honour of Augustus, would it have been built c25BCE with Greek features of Antae and Pronaos, and would such a dedication of a new Temple just have the ‘Tribunal’ tacked on? Most certainly not, and therefore it is fair to opine that the Temple of Augustus is no more than a renamed Temple of Fortune. The date is significant as it would have occurred at the time when the Army veterans (c28BCE) were being paid off and the Colonia Julia Fanestris (Fanum) was consecrated. That this new Colonia had a ready made Temple to honour Augustus Caesar and that it just happened to house the ‘Tribunal’ for the Magistrates to adjudicate upon the law would no doubt have been acceptable to Augustus with his money-saving ethos. Thus the “Fortune” of Fanum may be seen as a double fortune. 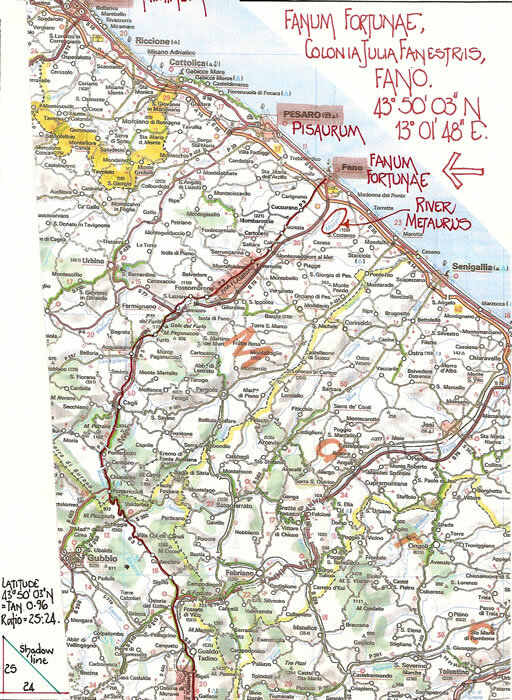 It was really the termination point of the Via Flaminia where it joined the north/south coastal route and it was the closest Polis to the defeat of Hasdrubal and thus Hannibal. Both of these occurrences are dated from 220 to 207BCE. 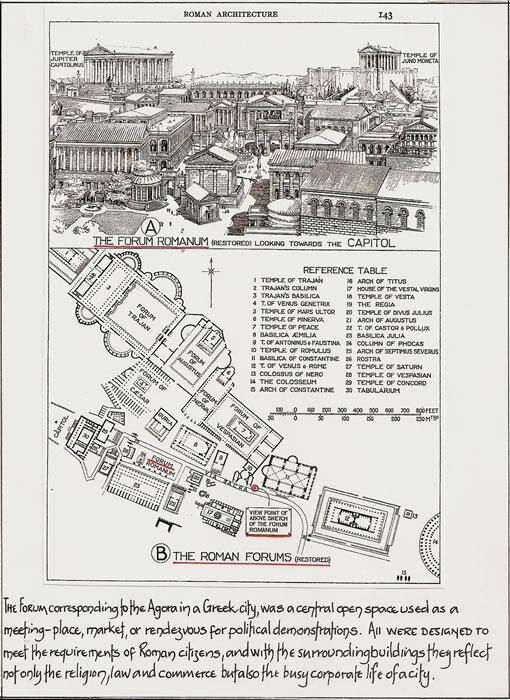 From the text of Vitruvius it is possible to speculate on one part of the Polis, it’s Forum, but that requires the overall size of the Basilica to be established. In previous texts RmVt1 and RmVt2 I have used three translations for the examination of his text as well as the Rowland/Howe book. I am continuing the same methodology here-in. The preface to Book 5 is typical of those preceding. Vitruvius seeks sympathy for the fact that he has not been recognised and endeavours by juxta-posing the name of Pythagoras within his text with his own endeavours hopes to gain kudos. The fact that it takes to the preface of Book 5 to state that the subject matter has been divided into small portions, that it might more easily strike the understanding of the reader, I find equally as bemusing as the other prefaces. Thus the Greek forum is primarily a meeting place, where-as the Roman forum was an entertainment centre. Hence, for the convenience of the spectators, the intercolmniations must be wider; and the bankers’ shops are situated in the surrounding porticos with apartments on the floors over them, which are constructed for the use of the parties, and as a depot of the public revenue. The size of the forum is to be proportioned to the populace of the place, so that it be not too small to contain the numbers it should hold, nor have the appearance of being too large, from a want of numbers to occupy it. The width is obtained by assigning to it two-thirds of its length, which gives it an oblong form, and makes it convenient for the purposes of the shows. That the forum is to be proportioned to the population of the Polis is another way of saying, ’build what you can afford.’ Poleis were ever changing entities and thus the forum may never be correctly proportioned. However the 3:2 ratio is perhaps a guide to the forum at Fanum Fortunae. The upper columns are to be made one-fourth less than those below; and that because the latter being loaded with a weight, ought to be stronger: because, also, we should follow the practice of nature, which, in straight growing trees, like fir, cypress, and pine, makes the thickness at the root greater than it is at top, and preserves a gradual diminution throughout their height. Thus, following the example of nature, it is rightly ordered that bodies which are uppermost should be less than those below, both in respect of height and thickness. Thus we may assume a column of 4 feet diameter or square is surmounted by a column of 3 feet diameter or square to form the colonnade of the forum. The basilica should be situated adjoining the forum, on the warmest side, so that the merchants may assemble there in winter, without being inconvenienced by the cold. Its width must not be less than a third part, nor more than half its length, unless the nature of the site prevent it, and impose a different proportion; if, however, that be longer than necessary, a ‘chacidicum’ is placed at the extremity, as in the Julian basilica and the one at Aquileia. The warmest side of the forum would normally be the north-side. Thus the sun is shining on three faces during the day (W/S/E) and this also ensures the maximum day-lighting into the basilica. The given proportions, between 1:3 and 1:2 width to length, which is then qualified as usual by Vitruvius, “to suit the nature of the site” introduces the question of just how easy it would be to insert a correctly proportioned basilica into an existing forum, considering the fact that they are a late invention. It would also be quite appropriate for a ‘chalcidicum’ to be inserted in a basilica regardless of size, as climate is surely the dictator of the necessity. The columns of Basilicae are to be of a height equal to the breadth of the portico, and the width of the portico one third of the space in the middle. The upper columns, as here-in above described, are to be less than those below. The parapet between the upper columns should be made one-fourth less than those columns, so that those walking on the floor of the basilica may not be seen by the merchants. The proportions of the architrave, frieze, and cornice may be learnt from what has been said on columns in the third book. It is thought that the columns of basilicas ought to be as high as the side-aisles are broad; an aisle should be limited to one third of the breadth which the open space in the middle is to have. Let columns of the upper tier be smaller than those of the lower, as written above. The screen, to be placed between the upper and lower tiers of columns, ought to be, it is thought, one fourth lower than the columns of the upper tier, so that people walking in the upper story of the basilica may not be seen by the business men. The architraves, friezes, and cornices should be adjusted to the proportions of the columns, as we have stated in the third book. Thus a 60 feet nave would have side aisles of 20 feet as follows in paragraph 6. The screen appears to be rather high if it is a visual break and the proportions of the entablature vary with column style thus the information is rather nebulous. “because of the two central columns on that side are omitted, so that the view of the Pronaos and the Temple of Augustus may not be obstructed: this is placed in the middle of the side wall of the basilica, facing the centre of the forum and the Temple of Jupiter”. Thus we can construct a simple diagram of the two Temples facing each other across the Forum and place the Basilica between the two. The Temple of Augustus (ex Temple of Fortune) is c60 x 120 feet over the plinth. For this purpose we may assume that the Temple of Jupiter is the same size as it does not affect the final size of the Forum. The Basilica as explained fully later is 120 x 180 feet over the plinth which was in all probability only 2 steps high. With a basilica 120 x 180 feet, it would have required at least 30 feet surrounding it as the construction site. Thus for the forum to have been of any use during this period, for commerce to have taken place and even the festivities that occur there, at least another 30 feet width is required. Thus it is possible to hypothesize that the Forum at Fanum Fortunae was at least 300 feet long and at least 180 feet between the two Temples. Then, when the Basilica is built there is still an open forum of at least 60 feet by 300 feet plus the side sections by the basilica. 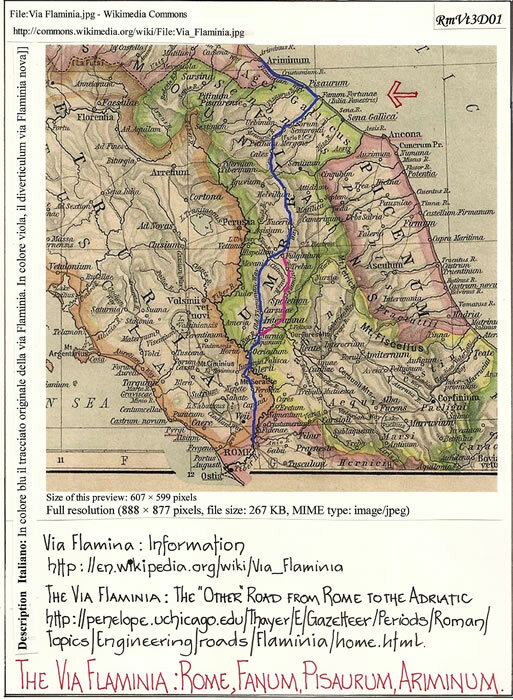 The Via Flaminia was built c220BCE and joined the coast road to Ariminium. Logically the forum would have been sited at this junction, set to one side no doubt to allow the free flow of traffic and the continuance of trade. Thus the above hypothesis may predicate an even larger Forum or just an open space adjacent to the sea shore with the town slightly inland and perhaps on higher ground to catch the on-shore breezes from the Adriatic Sea. It was also a Greek ideal to place Temples on promontories overlooking the sea, particularly important Temples of which the Temple of Fortune may well be one. It also leaves open the option of considering the Forum closed for Festivities because after the influx of retired Legionaries the necessity for a stadium arose. No doubt future excavations at Fano will answer many questions concerning the Polis. Basilicae, similar to that which I designed and carried into execution in the Julian colony of Fano, will not be deficient either in dignity or in beauty. The proportions and symmetry of this are as follow. The middle vault, between the columns is 120 feet long and 60 feet wide. The portico round it, between the walls and columns is 20 feet wide. The height of the columns, including the capitals is 50 feet, their thickness 5 feet, and they have pilasters behind them 20 feet high, two feet and a half wide, and one and a half thick, supporting beams which carry the floor of the portico. Above these, other pilasters are placed 18 feet high, two feet wide and one foot thick, which also receive timbers for carrying the rafters of the portico, whose roof is lower than the vault. But Basilicas of the greatest dignity and beauty may also be constructed in the style of that one which I erected, and the building of which I superintended at Fano. Its proportions and symmetrical relations were established as follows. In the middle, the main roof between the columns is 120 feet long and 60 feet wide. Its aisle round the space beneath the main roof and between the walls and the columns is 20 feet broad. The columns, of unbroken height, measuring with their capitals 50 feet, being each 5 feet thick, have behind them pilasters, 20 feet high, two and one half feet broad, and on and one half feet thick, which support the beams on which is carried the upper flooring of the aisles. Above them are other pilasters, 18 feet high, two feet broad and a foot thick, which carry the beams supporting the principal raftering and the roof of the aisles, which is brought down lower than the main roof. At the Julian Colony of Fano, I let out for contract and superintended the building of a basilica not inferior to these in dignity and grace. Its proportions and harmonies are as follows: there is a vaulted nave between the columns 120 feet long and 60 feet broad. The aisle between the columns of the nave and the outside wall is 20 feet wide. The columns are of an unbroken height, including the capitals, of 50 feet with a diameter of 5 feet. Behind them adjoining the aisles are pilasters 20 feet high, 2 ½ feet wide and 1 ½ feet thick. These carry the beams under the flooring. Above, there are pilasters 18 feet high, 2 feet wide and 1 foot thick, which take the beams of the roof of the aisles which is lower than the vaulting of the nave. Following on from this paragraph the thesis was developed in RmVt1, that Vitruvius was in fact an Apparitore or a Curatore. Thus it is only fitting to see him working in the official capacity of supervisor. He did not design the structure, although his input to save money may have been considerable. 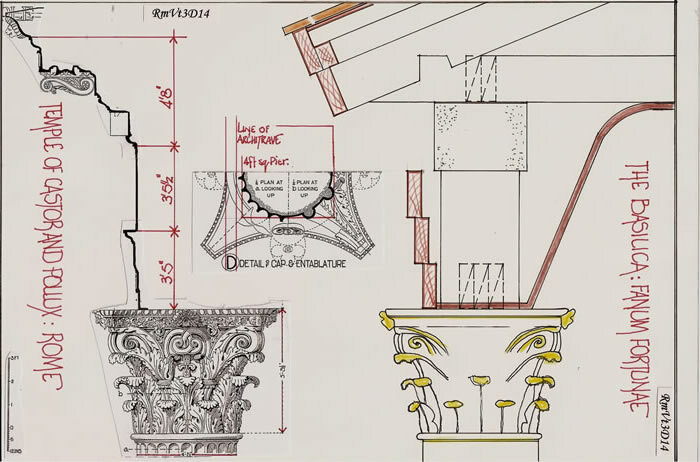 The proportions and symmetrical arrangements are foremost in Vitruvius’ mind. To be superintendent of a building which did not meet with the approbation of all would herald disaster for him. Therefore, perhaps he would have subjected the original design to detailed scrutiny to ensure success. The vaulted nave 120 x 60 feet is reminiscent of the plinth size of the Temple of Augustus, and thus we can determine an overall size for the Basilica with aisles of 20 feet. Breadth: 60+5+5 (2 columns) +20+20 (2 aisles) +2 ½+2 ½ (2 walls) +2 ½+2 ½ (side plinths) produces a total breadth of 120 feet. Length: 120+5+5+20+20+2 ½+2 ½+2 ½+2 ½, produces an overall length of 180 feet. This is classic Roman metrology where the inner vault of 120 x 60 feet becomes a threefold expansion to 120 x 180 feet overall. But it is also classically the Roman Land Division measure based upon 120 x 120 feet of the Actus Quadratus. Thus the Temples and Nave of the Basilica are ½ AQ and the Basilica overall is 1 ½ AQ. The columns 50 x 5 have generally been taken as Corinthian style with a ratio height to diameter of 10:1. This is also the preferred style of the era. Whether the columns were fluted or not really depends upon the stone or method of construction used, and of course the finances. The fact that pilasters are set behind each column may infer they were plain or only half fluted as the 2 ½ feet pilaster would hide 1/8th of the circumference or half the width if they were square columns. But the 4 corner columns require having two pilasters at right angles to allow the corner of the gallery to be constructed and thus this probably lends weight to my thought that the columns are square and not circular. 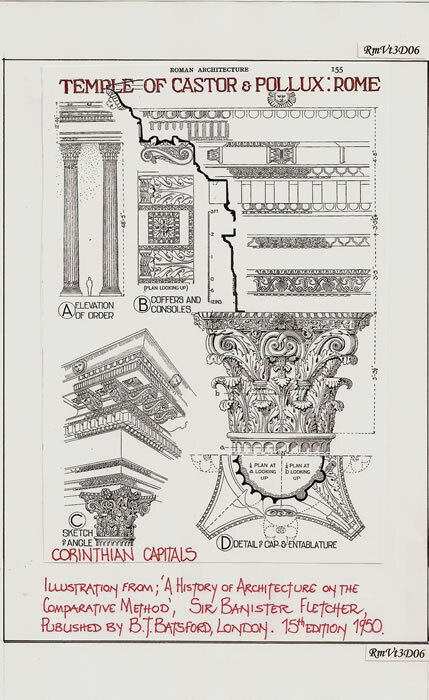 The Corinthian Style of column and entablature shown on the diagram is taken from Sir Banister Fletcher’s book page 155. It illustrates the Temple of Castor and Pollux; Rome, now dated to c6CE although originally built in 496BCE. It was rebuilt by Tiberias as part of the forum. It is a peripteral temple and was on a raised platform some 22 feet high. The columns are 48 feet 5 inches high and have unique Corinthian capitals. The entablature with carved mouldings and a plain frieze has Lion heads to throw off the rain water. It should be noted that when describing the columns Vitruvius does not use the word “diametros” and therefore it is quite likely the columns were square and easily used to place pilasters behind. What is also not stated is the material from which the columns are made. They could quite easily be stone blocks built like a wall, with the pilasters bonded in and the whole rendered or plastered to give a smooth finish for painting. Pilasters would also normally be set against the outside walls to allow the beams to span in both directions, with the floor boards or roof rafters set over them. The height of the lower pilaster is 20 feet and thus produces a square section for the aisle shape. 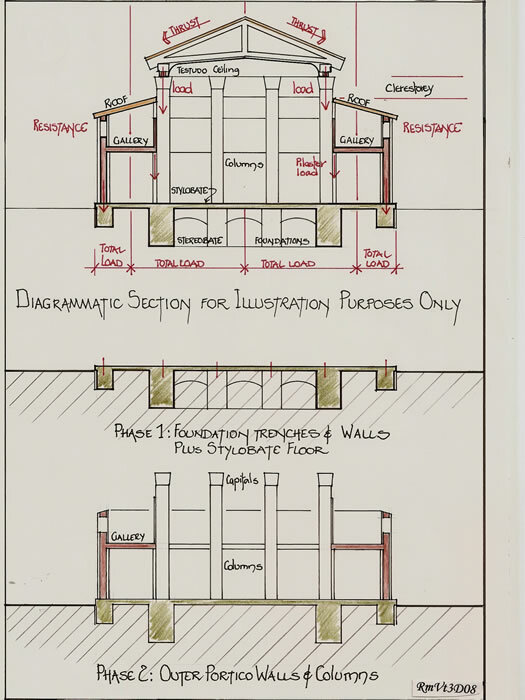 If we allow 2 feet for the floor construction and then the 18 feet of the upper pilasters of the gallery level, we actually have double 20 feet dimensions overall. 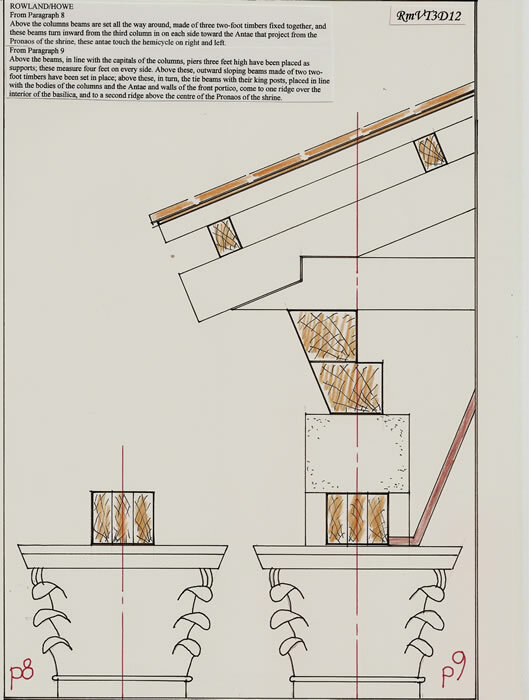 If we allow the same 2 feet for the gallery roof construction then the overall height is 42 feet which leaves a clear-storey of 8 feet to the top of the Column at 50 feet. The spaces remaining between the beams, over the pilasters and the columns, are left open for light in the intercolumnations. The columns in the direction of the breadth of the vault are four in number, including those on the angles right and left; lengthwise, in which direction it joins the forum, the number is eight, including those at the angles; on the opposite side, including all the angular columns, there are six columns, because the two central ones on that side are omitted, so that the view of the Pronaos of the Temple of Augustus may not be obstructed: this is placed in the middle of the side wall of the basilica, facing the centre of the forum and the Temple of Jupiter. The spaces remaining between the beams supported by the pilasters and the columns are left for windows between the intercolumniations. The columns are: on the breadth of the main roof at each end four, including the corner columns at right and left; on the long side which is next to the forum, eight, including the same corner columns; on the other side, six, including the corner columns. This is because the two middle columns on that side are omitted, in order not to obstruct the view of the Pronaos of the Temple of Augustus (which is built at the middle of the side wall of the Basilica, facing the middle of the forum and the Temple of Jupiter) and also the tribunal which is in the former Temple, shaped as a hemicycle whose curvature is less than a semicircle. The space which remains in the intercolumniations, above the pilasters and below the tops of the columns, admits the necessary lighting. In the width of the nave counting the corner columns right and left there are four columns at each end. On the side adjoining the forum, there are eight, including the angle columns. On the other side there are six, including the angle columns. The two columns in the middle are omitted, so as not to obstruct the view of the Pronaos of the Temple of Augustus which is situated in the middle of the side wall of the basilica and faces the middle of the forum and the Temple of Jupiter. Thus the light for the interior of the Basilica, particularly the central nave comes from a series of openings around the perimeter of the roof structure. As stated it is the height of the columns minus the constructed height of the aisles of 42 feet allowing thus an 8 feet window. Given that we already have a gallery level, Vitruvius informs us that the screen should be ¾ of the height or some 13 ½ feet. But if there are no openings in the external gallery wall then this area would be in darkness. This must be revisited after Paragraph 10 has been discussed. Given we know the number of columns and their overall setting out, “between the columns”, we can discuss the planning of the basilica. Width; 4 columns with an internal distance of 60 feet gives three intercolumniations plus two column widths of 5 feet. Thus the intercolumniation is 16 2/3rds feet or 21 2/3rds feet centre to centre of columns. Length; 8 columns with an internal distance of 120 feet gives 7 intercolumniations and six column widths of 5 feet. Thus the intercolumniations are 12 feet 10 ¼ uncia or 17 feet 10 ¼ uncia centre to centre. But as we have already seen, in all probability the Temple of Augustus has an overall width of c54 feet and the removal of two columns provides for 3 x 17 feet 10 ¼ uncial which equals 52 feet 6 ¾ uncial and is in all probability the reasoning for the Basilica column centres. The tribunal is in the shape of a segment of a circle; the front dimension of which is 46 feet, that of its depth 15 feet; and is so contrived, that the merchants who are in the basilica may not interfere with those who have business before the magistrates. Over the columns round the building architraves are placed. These are triple, each of them 2 feet in size, and are fastened together. At the third column, on the inside they return to the Antae of the Pronaos, and are carried on to meet the segment on the right and left. The open side of this hemicycle is 46 feet along the front, and its curvature inwards is 15 feet, so that those who are standing before the magistrates may not be in the way of the business men in the basilica. Round about, above the columns, are placed the architraves, consisting of three two-foot timbers fastened together. These return from the columns which stand third on the inner side to the Antae which project from the Pronaos, and which touch the edges of the hemicycle at right and left. The tribunal which is in the former Temple is in the shape of the segment of a circle. The width of the segment in front is 46 feet; its depth is 15 feet; so that those who come before the Magistrates may not interfere with the persons on business in the basilica. Above the columns are beams made of three two foot joists bolted together. These return from the third column on either side of the opening to the Antae of the Pronaos, and adjoin the curve of the tribunal left and right. I have already discussed the overall dimensions of the Temple necessary to accommodate a 46 foot wide tribunal. But the question remains as to the direction the tribunal faced. Was it inwards towards the Temple of Augustus as this would ensure all were not turning their backs on the original shrine or latterly the Caesar, particularly the Magistrate. Or was this permissible so that the plaintiff or similar faced the Temple and thus the deity that was Caesar. 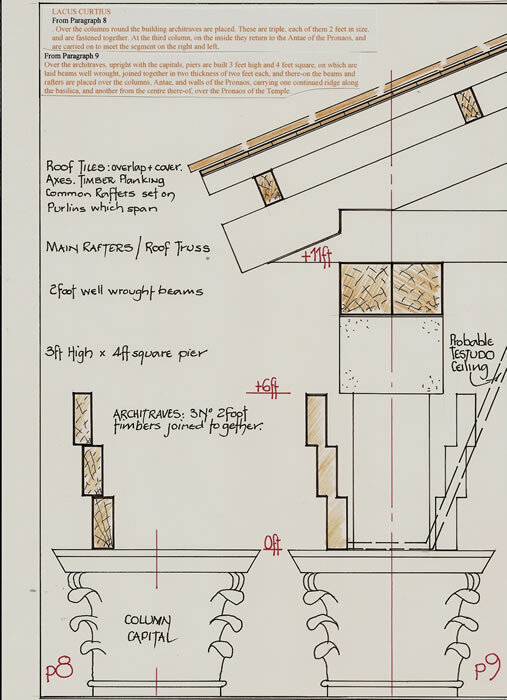 Architraves or Beams; It is normal in the Corinthian style that the architrave is stepped and thus we may consider that these three 2 foot sections sit one on another with an overhang to each to form a simple profile. The Latin text uses the word TRABES, which is normally a beam and not as previously discussed. 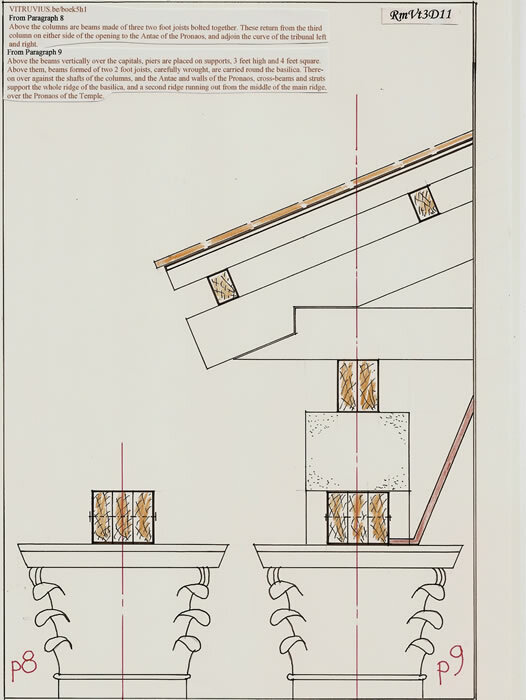 With the return to the Antae and Pronaos we have a positive statement by Vitruvius that there was a correlation between the column spacing of the basilica and the Temple elevation. They adjoin the curve of the tribunal (46 feet) right and left. But more importantly the beams or architraves return to the Antae which indicates there must be a correlation of heights to enable the simple construction. We do not know if this is merely a junction or if in fact the roof of the basilica is carried over the tribunal which until then would have been in the open air, but it seems likely this is the main reason for the roof extension. Thus we can assume the Temple had a plinth and the height of the basilica columns was decided by the overall height of the Temple of Augustus. Over the architraves, upright with the capitals, piers are built 3 feet high and 4 feet square, on which are laid beams well wrought, joined together in two thickness of two feet each, and there-on the beams and rafters are placed over the columns, Antae, and walls of the Pronaos, carrying one continued ridge along the basilica, and another from the centre there-of, over the Pronaos of the Temple. Above the architraves and regularly dispersed on supports directly over the capitals, piers are place, 3 feet high and 4 feet broad each way. Above them is placed the projecting cornice round about, made of two 2 foot timbers. The tie-beams and struts, being placed above them, and directly over the shafts of the columns and the Antae and the walls of the Pronaos, hold up one gable roof along the entire basilica from the middle of it, over the Pronaos of the Temple. Above the beams vertically over the capitals, piers are placed on supports, 3 feet high and 4 feet square. Above them, beams formed of two 2 foot joists, carefully wrought, are carried round the basilica. There-on over against the shafts of the columns, and the Antae and walls of the Pronaos, cross-beams and struts support the whole ridge of the basilica, and a second ridge running out from the middle of the main ridge, over the Pronaos of the Temple. For piers to be placed ‘above’ the architraves the supports would require to be built 6 feet high before the pier cap 3 x 4x 4 could be placed. This will in fact introduce another void in the elevation 3 feet high. The projecting cornice made of 2 x 2foot timbers is no doubt fixed to the end of the roof structure, particularly the angled rafters. But if the text is ‘beams,’ and not ‘architraves,’ a very different picture emerges as is discussed later. The roof shape is described in this paragraph leading us to believe it is a main gabled section with a secondary roof of the same profile at right angles, thus requiring two valley gutters. But there is no description of the roof itself, its actual construction or finish externally. There is no detail given as to the support of the secondary roof over the Antae and Pronaos of the adjoining Temple, merely a hint that the walls of the Antae and Pronaos may have played a part. The roof shape is certainly innovative for a Roman Basilica, but yet again it was surely dictated by the necessity of the link to the Temple. I wonder if the Basilica could have been turned through 90 degrees, space permitting, would it have been a straight forward pitched roof with extra columns forming a weather guard over the Pronaos/Antae of the Temple. The width would have been perfect for such a plan. Thus the two-fold direction of the roof gives an agreeable effect outside, and to the lofty vault within. Thus the omission of the cornices and parapets, and the upper range of columns, saves considerable labour, and greatly diminishes the cost of the work; and the columns in one height brought up to the architrave of the arch, give an appearance of magnificence and dignity to the building. Thus there arises from the roof a double arrangement of gables. This gives a pleasing effect both to the exterior of the roof and to the high vaulting within. Further, we dispense with the ornaments of the entablatures and the provision of the upper columns and parapets. We are relieved from laborious details and escape a large expenditure. While carrying up of the columns without a break to the beams of the vault seems to give a sumptuous magnificence and impressiveness to the work. It is obvious from this last paragraph that the whole exercise was to provide a Basilica for as little money as possible; that is in both the materials and the labour necessary to build it. The roof has no decoration at all to its perimeter and thus it is fair to opine that the rainwater just ran off and discharged onto the lower aisle roof. 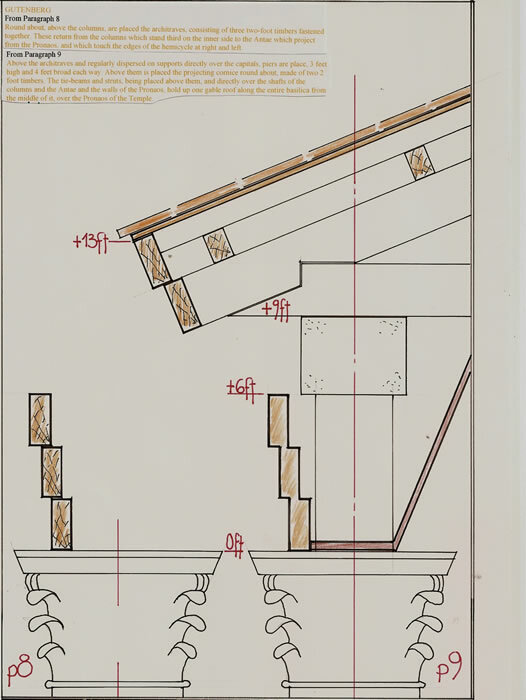 I think the parapets referred to are in fact the cornice which would have hidden the gutters. The saving of the second tier of columns is spurious as they are actually required albeit in the main columns which are full height. What is unclear is the treatment of the gable ends; are they in fact vertical and require decoration, or are they “hipped” roof areas which obviated that necessity. There is so little actual technical detail that it is hard to believe Vitruvius is describing a building, the one and only he has been involved with. Was he perhaps unsure of its reception? The final sentence is surely quite damning in that he states “seems to give a sumptuous magnificence”. This is his chance to say, ’look how good I am’, and it flops badly. He is unsure of its visual appearance. The description given by Vitruvius is not that of its designer/architect; more of a person remembering certain aspects of the construction where he endeavoured to save time and money. For all his discussions concerning design and symmetry in the preceding four books, when it comes to the one building he was intimately involved with his descriptive talents evade him and the Basilica as presented is plain and simple and is thus positively boring. The only question we will probably never answer is, “who was the innovative designer who determined that the columns should be full height, and thus started a later trend?” But was it really so innovative? Many Greek Temples have full height columns of similar size. 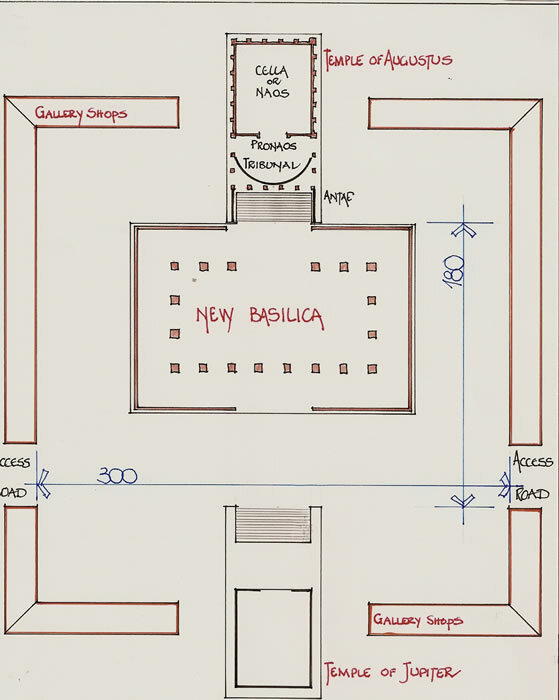 The primary research to be carried out in order to evaluate what the basilica may have looked like is to understand the elements of the construction as described in the text and as explained in the foregoing notes. The basic plan is two rectangles set symmetrically about each other; the first is the rectangle of the main columns with pilasters and the second the rectangle of the outer walls. These are the major elements of the construction and thus the structural basis of the basilica. Hence the foundations are simplified to two major excavations, although the inner trench for the column rectangle will be some four times that of the outer wall trench. The basic loading of the superstructure upon the foundations determines that fact. The foundation for the outer walls merely supports that wall, half the load of the gallery floor and half the load of the gallery roof. The foundation for the column rectangle however must support the other half of the gallery loading plus half the total basilica loading of columns and roof. This load upon the columns from the roof will also have a thrust component trying to push the columns apart which if the roof trusses are tied correctly would not be excessive, but it will be there. The resistance is provided by the pilasters, gallery floor and roof structure acting as a buttress. The simplicity of this construction provides for multi tasking in the construction programme as both sets of foundations can be excavated at the same time, basically not affecting each other at all. But it also means that once the foundations have been built and the floor sections laid the outer walls and the columns can be built simultaneously allowing the gallery to be constructed as the work progresses upwards. Thus by the time the column capitals are added the perimeter of the basilica is completed and only the roof requires to be added. There would have been a special phase, that of joining the basilica to the Temple of Augustus over its Antae and Pronaos, but this in all probability was carried out whilst the main roof was being built. The floor of the nave could then be completed and the decoration as it may have been added. There are several elements missing which are necessities for the function of the basilica. The first are two staircases for access to the two halves of the gallery. The second is probably a hipped portico on the forum side of the gallery to discharge water away from the entrance which would have been opposite the two Temples alignment. The part of the construction which has caused the most disparity in translation is the section from the top of the gallery roof to the eaves of the main roof, and of course the junction to the Temple of Augustus. I am therefore using each text in the order as above and analysing the design and construction stated there-in. Over the columns round the building architraves are placed. These are triple, each of them 2 feet in size, and are fastened together. At the third column, on the inside they return to the Antae of the Pronaos, and are carried on to meet the segment on the right and left. Round about, above the columns, are placed the architraves, consisting of three two-foot timbers fastened together. These return from the columns which stand third on the inner side to the Antae which project from the Pronaos, and which touch the edges of the hemicycle at right and left. Above the columns are beams made of three two foot joists bolted together. These return from the third column on either side of the opening to the Antae of the Pronaos, and adjoin the curve of the tribunal left and right. Above the columns beams are set all the way around, made of three two-foot timbers fixed together, and these beams turn inward from the third column in on each side toward the Antae that project from the Pronaos of the shrine, these antae touch the hemicycle on right and left. Above the beams, in line with the capitals of the columns, piers three feet high have been placed as supports; these measure four feet on every side. Above these, outward sloping beams made of two two-foot timbers have been set in place; above these, in turn, the tie beams with their king posts, placed in line with the bodies of the columns and the Antae and walls of the front portico, come to one ridge over the interior of the basilica, and to a second ridge above the centre of the Pronaos of the shrine. The origin and invention of different species of columns having been discussed, it is now necessary to say something on the subject of their ornaments, how they originated, and upon what principles and for what purposes they were invented. In all buildings the timber framed work, which has various names, crowns them. The timbers vary as much in their uses as in their names. Those are called bressummers (trabes) which are placed over columns, pilasters (parastatae), and antae. In the framing of floors, beams (tigna) and boards (axes) are used. If the span of a roof be large, a ridge piece (columen) is laid on top of the king post (columna, whence is derived the word column), and a tye beam (transtrum) and struts (capreoli) will be necessary. If the roof be of moderate span, the ridge piece (columen), and rafters (cantherii), of sufficient projection at their feet to throw the water off the walls, will answer the purpose. On the rafters are laid purlines (templa), and again on these, to receive the tiles, are placed common rafters (asseres), which must be of sufficient length to cover the walls and protect them. Since the origin and invention of the orders of columns have been described above, I think it not out of place to speak in the same way about their ornaments, showing how these arose and from what original elements they were devised. The upper parts of all buildings contain timber work to which various terms are applied. And not only in its terminology but actually in its uses it exhibits variety. The main beams are those which are laid upon columns, pilasters, and antae; tie-beams and rafters are found in the framing. Under the roof, if the span is pretty large, are the crossbeams and struts; if it is of moderate extent, only the ridgepole, with the principal rafters extending to the outer edge of the eaves. Over the principal rafters are the purlines, and then above these and under the roof-tiles come the common rafters, extending so far that the walls are covered by their projection. Quoniam autem de generibus columnarum origins et inventions supra sunt scriptae, non alienum mihi videtur isdem rationibus de ornamentis eorum, quemadmodum sunt prognata et quibus principiis et originibus inventa, dicere. In aedificiis omnibus insuper conlocatur materiatio variis vocabulis nominate. Ea autem uti in nominationibus, ita in res varias habet utilitates. Trabes enim supra columnas et parastaticas et antas ponuntur; in continationibus tigna et axes; sub tectis, si maiora spatial sunt, et transtra et capreoli, si commode, columen, et cantherii prominentes ad extremam suggrundationem; supra cantherios templa; deinde insuper sub tegulas asseres ita prominentes, uti parietes protecturis eorum tegantur. Now since the origins and discovery of the orders of columns have been described above, it does not seem foreign to my purpose if I speak in the same way about their ornaments; how they came about, and from what principles and origins they were invented. In all buildings timbering, called by various names, is used in the upper parts; as in name, so in practice, it has uses for various things. Beams are placed on columns, pilasters and responds. In floors there are joists and planks. Under roofs, if the spans are considerable, both cross pieces and stays; if of moderate size, a ridge piece with rafters projecting to the edge of the eaves. Above the principal rafters, purlins; then above, under the tiles rafters which overhang so that the walls are covered by the eaves. The descriptive text by the translators may be explained thus. A Bressummer (the same as a Breastsummer) is a summer or beam supporting the whole front of a building in the same way as a lintel supports the portion over an opening. A Summer can be the first stone laid over columns or pilasters to form a cross vault; the central beam of a floor which receives joists; any large piece of timber supported on two strong piers or posts and serving as a lintel to a door, window etc. The other names are the common timbers of a roof as shown on the diagram. There is no attempt in this text to fully reconstruct the form of this Basilica. From the information contained within Book 5 it is actually impossible and would be a guessing game. It is possible to hypothesize on certain aspects. The missing entablature is, and on Diagram RmVt3D14 I have juxtaposed a typical Corinthian style entablature with a generalisation of the four translations used in order that a comparison may be made, albeit only in diagrammatic form. I have drawn a diagrammatic cross-section, RmVt3D15, to illustrate the main design parameters included by Vitruvius and reasons for the overall shape. On RmVt3D16, a diagrammatic part-longitudinal-section, I have indicated a possible Temple façade which would fit the dimensions of the Basilica, which as I have opined were probably determined from that Temple and the Tribunal therein. 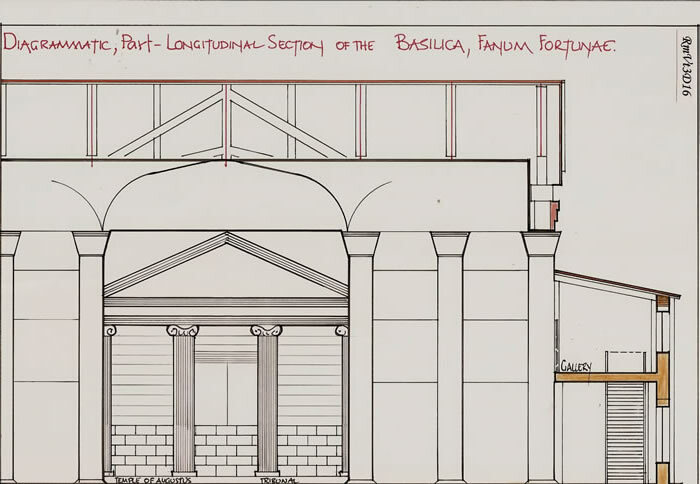 The Basilica at Fanum Fortunae is a cheap, quickly constructed building having little or no ornamentation and consequently has not been afforded a full description by Vitruvius. It is probably the one and only building he was the supervising officer for and it produced no plaudits for him to gain any consolation for his lack of notoriety. It also appears he did not fully understand the construction. I would caution all readers and researchers to look carefully at the many reconstructions for the Basilica. There is no doubt the drawings are in themselves masterpieces, but they are figments of the imagination, with as I have shown little actual hard fact to produce such beautiful buildings.